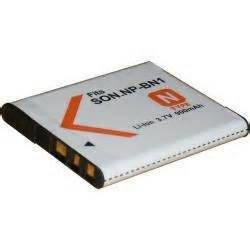 NP-BN1 : 3.6 volt 900mAh rechargeable Li-ION battery for SONY digital cameras. Replaces original # NP-BN1. Fits the following SONY cameras: DSC-TX66, DSC-T110, DSC-T99, DSC-TF1, DSC-TX10, DSC-TX100V, DSC-TX20, DSC-TX200, DSC-TX30, DSC-TX5, DSC-TX55, DSC-TX7, DSC-TX9, DSC-W310, DSC-W330, DSC-W350, DSC-W360, DSC-W370, DSC-W380, DSC-W390, DSC-W510, DSC-W530, DSC-W560, DSC-W570, DSC-W620, DSC-W650, DSC-W690, DSC-W710, DSC-W730, DSC-WX5, DSC-WX50, DSC-WX80, DSC-WX9. 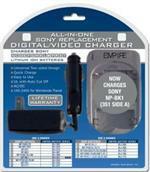 THe NP-BN1 re-charges with the stock battery charger, and also with our DVU-SON-1 charger system.